Maine wants to develop 8-player football divisions. Now it’s getting closer to becoming a reality. 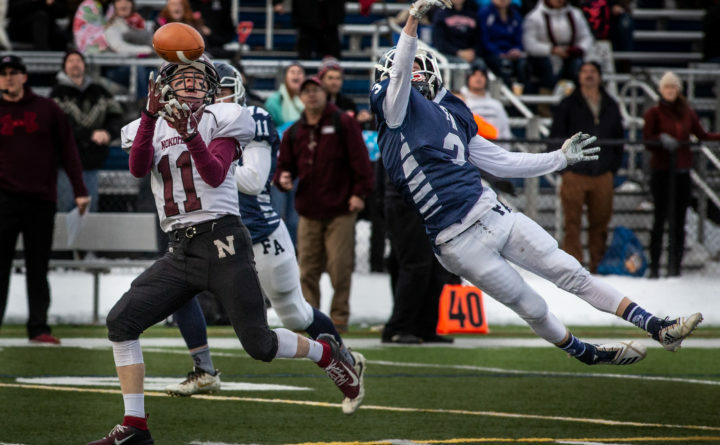 Both Nokomis High School's Tyler Pelletier (left) and Fryeburg Academy's Nathan Knapp attempt to catch the ball in the Class C state football championship game in Portland in this Nov. 17, 2018, file photo. A framework for adding two, eight-player divisions to Maine high school football beginning next fall inched closer to formality Tuesday.